This guide relays the syntax needed in Xero to create different pay conditions for your employees. Before you get started, please make sure that you have set up both your Xero and Deputy accounts. Next, please go to your Location Settings from your Home page. Next, please go to Settings for Payroll, then click Connect to connect to Xero. If you have not already imported your employees from Xero, please do so now. If you have already added staff without importing from Xero, please first make sure that your employees' names and email addresses match up between Deputy and Xero. Please note: Award Interpretation is only necessary if you require Award rates. If you do not, please set simply set up your rates as usual. Where Do I Write The Rates? In Xero, please go to your Settings. Next, please select Payroll Settings. 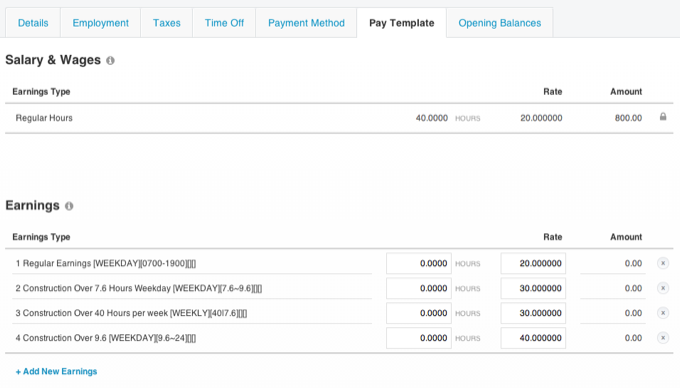 From Payroll Settings, please select Pay Items, then "+Add Earnings Type". After creating the rate, please apply it to your employees. To do this, please go to Payroll, then Employees. From there, please select an employee. Next, go to their Pay Templates and click "+Add New Earnings". Please note that in your Employee's Employment Page, you must click "Adjust Wages and Salary" and apply the same Regular Hours rate as they have in their Earnings Line. To set a salary item in Xero, first create the rate with the type "Regular Earnings". Then, please select your employee on the Employees page, then click their "Employment" tab. Next, please scroll down to "Adjust Salary and Wages, in which you will need to select the rate you just set, then set it to "Salary", which will then allow you to adjust the amount. Next, you will need to set the date on which the salary begins. Finally, please click "Save" at the bottom of the screen. When Deputy evaluates someone's roster or timesheet to calculate the associated cost, it will calculate the wages based on how the rate is named. The way Deputy handles this depends on two things: how you name the rates in Xero and how you allocate them in employee's pay template in Xero. All that you will need to do to set up your Award Interpretation is to write your rates in a specific manner. For example, you have probably written a pay item in Xero as "Adult Saturday Rate". Now you will write it as "Adult Saturday [SAT][ALLDAY]". The Number determines the order in which the Deputy will sort the rate, with 0 being the most common rate. Generally, this will be your Ordinary rate. You can set the title of the rate as whatever you'd like. The [DAY] bracket determines the days on which the rate will apply. The [FROMTIME-TOTIME] bracket allows you to set the specific time or hours for that rate to apply. The [MIN-MAX] bracket sets the hours of a shift that a rate may apply for. This is generally used for allowances and overtime. The [TRACKING] bracket will restrict the pay rate to a certain rostering area, for example if you have set up a "kitchen" rostering area in Deputy, you can set the tracking category so that it will only apply to people working in the kitchen. The Area Export Codes and Tracking Codes will need to be set up first. You may also use the name of the Rostering Area in this bracket, which will be used to pay employees working from that area. For the award interpretation to work, you must use specific language when naming your rates. Below is a list of the terms you may use and which bracket it must be used in. Please note that even for a bracket you want to leave empty, you must write the bracket itself into the rate. Please open it and close it with no space in the middle, like this: . You must have all four brackets present in the rate for the system to work. When you assign these pay items in employee's profile, you must place the most common pay item at the top (e.g., ordinary hours) and the least common item at the bottom (e.g., public holiday rate). 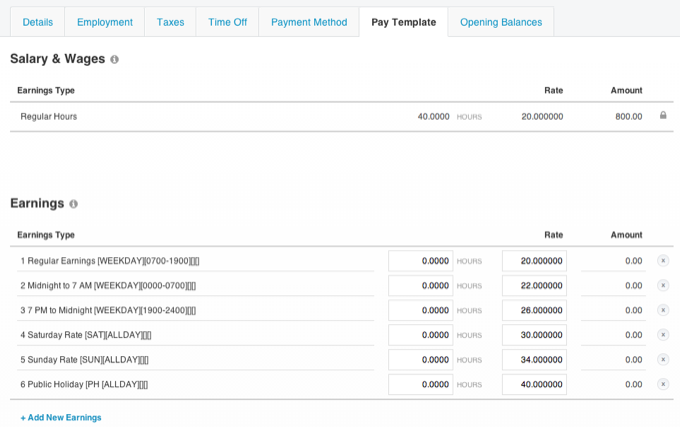 Please note that Xero may order the pay items back to front. To ensure that this doesn't happen, please order your rates with a number before the rate, with 0 being the most common rate. There is also a 100 character limit. When Deputy evaluates a Timesheet to check which rate should be paid, it will look at the bottom-most condition first, then work it's way to the top. When it finds an applicable rate, it will check which portion of the shift applies before going on to next pay item. !PH - not public holiday. WEEKLY - If you wanted to count the entire week towards these hours. Handy for 40 or 38 hours per week items. You must also specify the weekly total hours and daily hours exclusion below. ALLDAY- The default, which will make the rate apply for the whole day. 0000-2359 - must be 4 digit 24-hour time. 0.0~2.0 - The rate will apply from the beginning (0.0) to the second hour (2.0) of the shift. For this to apply, you will need to set MON/TUE/WED/PH as above. Aggregates such as DAILY, WEEKDAY, WEEKEND can't be used. 40|8 - On the left of the bracket should be your weekly hours, then a vertical line with the number of hours per day to include. For example, pay overtime for more than 40 hours per week but don't count more than 8 hours per day as they will be counted by other overtime scripts. NONE- You can use this, or leave the bracket empty. 1-4 - This rate will be paid for a minimum of 1 hour and maximum of 4 hours. Note that it's only applicable if the Xero rate type is "Allowance". TOUCHFULL- If part of the shift matches the TIME bracket, then the whole shift will be paid in this rate. For example, if you have Rate A that applies between 3 PM and 6 PM, then a Rate B that applies from 6 PM til midnight, and B is set to TOUCHFULL, a shift that is worked from 3 PM till 9 PM would be paid entirely at the B rate. In the tracking bracket, you can write the name of one of your Tracking Codes or Scheduling Areas. If you do so, the rate will only apply if a shift has been worked in the corresponding area. This is useful for settings multiple rates on an individual who works in more than one area, such as a barista who also works in the bar. You can view our available scripts in Deputy's github repository. If you have a scenario that is not yet covered by a script, please get in touch with us. Here we will show you examples of rates that you may write in Xero. You may copy these rate into Xero as is. You can then type in your own dollar value as per the rate you are paying. Assuming you have the Regular Earnings as your base rate, you may set most of the other rates as multipliers of the base rate. For example Overtime could be either a 1.5x or 2x multiplier. Ideally, you can leave everything as a multiplier rate of the Ordinary Rate. You can set a rate as a multiple by selecting "Overtime Earnings as the Earnings Category and "Multiple of employee's Regular Earnings" as the rate type when the rate is first created. This will be necessary if your employees accrue leave through hours worked. You can copy and paste these rates into Xero as Earnings Types. In Australia, there are a number of different construction awards however we will tackle some common ones here, demonstrating how overtime works with Xero. If you work construction for more than 7.6 hours in a day, you will be paid 1.5x your Regular Earnings. After 9.6 hours, it's double time. If you work more than 40 hours per week, you also receive 1.5x. You can copy and paste these rates into Xero as Pay Items. After you have finished creating your rates and applying them to your employees, please go to the People page and Edit each employee, setting their Pay Rates to Automatic. You must be connected to that employee's work location to set their rates to Automatic. You can see which employees are connected to Xero from the People page, by clicking "Show Fields" at the top of the list, then "Pay Rates". 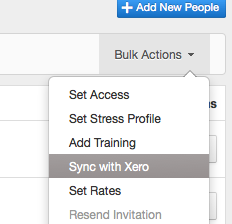 Please select each employee with the Xero icon next to their name, then click "Bulk Actions" at the top right hand corner of the list and click "Sync with Xero". If one of the employees you have selected is not connected to Xero, this option will be greyed out. Please note that if you re-sync the rates, you will also need to unapprove and re-approve your timesheets for the new rates to apply.